Born to Jagaveera Kattabomman and Arumugathammal on 3 January 1760, Veerapandiya Kattabomman belonged to the Bommu and Aathi Kattabomman clan in the village of Panchalankurichi in Thoothukudi district of Tamil Nadu. Though most historical accounts cite the revolt of 1857 as the ‘first war of independence’ in India against the British, they seem to overlook a valiant chieftain from Tamil Nadu in the late 18th century who refused to align with the sovereignty of the British East India Company, and singlehandedly waged war against the colonialists. His father was a Palayakarar (a feudal title for a class of territorial administrative and military governors appointed by the Nayaka dynasty in southern India during the 16th and 18th centuries), from whom Veerapandiya assumed the position of the 47th Palayakarar when he turned 30. At the time the East India Company was establishing itself in the southern parts of the Indian peninsula, and a base was set up in Tirunelveli. 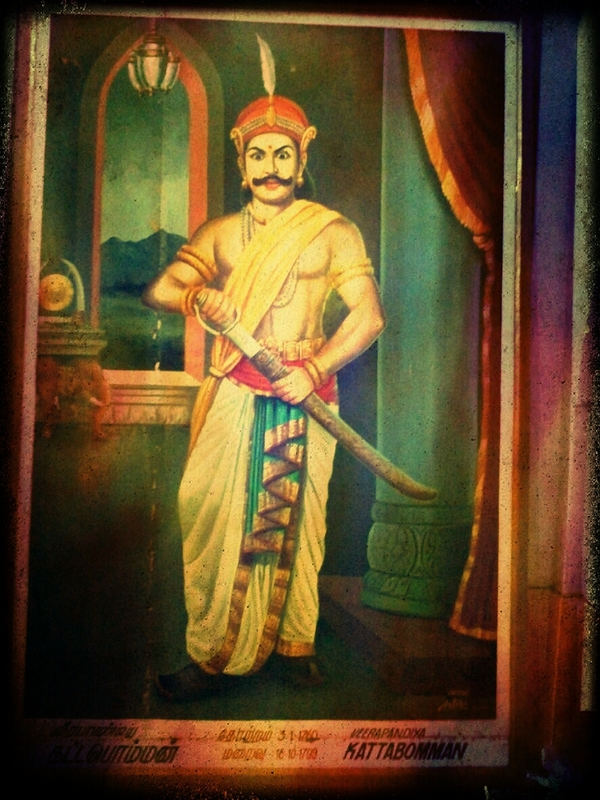 The valiant chieftain, Veerapandiya Kattabomman. Source: Ashwini’s Space. So how did the British manage to maintain a stronghold in the region? It was a well-calculated move. They lent huge sums of money to the Nawab of Arcot and demanded to be repaid through taxes and levies from all the Palayakarars under the Nawab’s domain. As the Nawab was in severe debt, watched as his people were plundered by the British in the name of tax collection. Except for Veerapandiya, every other Palayakarar yielded to the diktat of the company. In fact, the British were quite crafty and tried to establish cordial alliances with all the regional statesmen, who in turn tried advising Veerapandiya to ally with the former and live in peace. However, the young chieftain wasn’t one to relent and resisted all forms of pressure from the British. He openly declared his dissent against the regime and refused to support them in any of their undertakings. 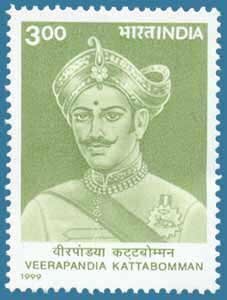 The postal stamp commemorating the bicentenary of Veerapandiya’s execution. Source: AmrutPhilately. Emerging as an undesirable element in the plan that the British had for the region, they began working on different conspiracies to bring the rebellious chieftain down. However, they remained unsuccessful in their schemes until the British army suddenly decided to raid Panchalankurichi under the command of Major J. Bannerman in 1799. As the entire village had been in Thiruchendur for a temple festival, the British hoped to ambush Veerapandiya unawares. But he had already learnt of the attack through his informers and had prepared well in advance. You may also like: 10 Names from the Indian Freedom Struggle You Might Not Know. But You MUST. Right before the attack, Veerapandiya was ordered to surrender unconditionally through a messenger sent by Bannerman. “We are the sons of this soil. We live with prestige, honour and dignity and we let our soul die for the prestige, honour and dignity of our land. We don’t bow down to the foreigners. We will fight until death,” was the smarting message taken back to the army commander. Veerapandiya and his men held the fort quite valiantly against British troops, who couldn’t quite match up to their expertise and had to withdraw. However, Veerapandiya knew that his fort would not be able to withstand the onslaught if the British were to unleash their cannons. That night, he left the fort with his men and took refuge in the forests of Thirukkalambur close to Pudukottai. The legendary Veerapandiya Kattabomman. Source: Youtube. Upon receiving information about their hideout, the British threatened the king of Pudukottai, Vijaya Raghunatha Tondaiman to trace and handover the elusive chieftain or face similar consequences. Buckling under pressure, he sent his soldiers to track down Veerapandiya, who was subsequently arrested at Kayathar on October 1, 1799. Following an interrogation stretching over 15 days and a ridiculous trial, Veerapandiya was sentenced to public execution. Even in the face of death, he didn’t flinch and continued to stand by his ideals of honour, dignity and prestige. He even boldly argued for the right of his homeland and admonished the British for their immoral and illegal occupation. Veerapandiya Kattabomman was hanged on October 16, 1799, thus putting an end to the first ever known revolt against the Empire. As an ode to the great chieftain, the state government of Tamil Nadu erected a memorial in Kayathar, which was inaugurated by the then Chief Minister late J Jayalalitha in 2015. In the name of his homeland. Source:Rarepicsalbum. The remnants of his old fort at Panchalankurichi is protected by Archaeological Survey of India. On October 16, 1999, a postage stamp commemorating the bicentenary of Veerapandiya’s execution was released by the government of India in his remembrance. Every year, the district administration of Tirunelveli honours the legend and his heroic deeds by celebrating the ‘Veerapandiya Kattabomman festival’ at Panchalankurichi on his birth anniversary. Besides, there is an Indian Navy communications centre at Vijayanarayanam, which is named INS Kattabomman after the brave freedom fighter. On his 258th birth anniversary, let’s remember the valiant Palayakarar from Panchalankurichi who refused to bow down to the British and sacrificed his life for his homeland.